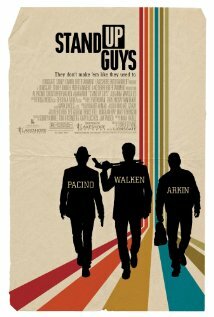 Review: Entertaining, is the best way to describe "Stand Up Guys", a movie that joins Al Pacino, Christopher Walken and Alan Arkin as three ex-gangsters who meet again after 28 years. Val (Pacino), gotten out of prison, demands party all night long with everything he misses most: drugs, alcohol, women and dancing. He will be escorted by his best friend Doc (Walken), who was tasked with a cruel assignment before he retires. He will have to kill Val, following the orders given by a dreaded headman. Arkin plays a small role as driver, but introduces some zippy moments in a crucial phase of the story, turning it more vibrant. Among some laughable moments (mostly about nostalgia for the old times or sexual desire and performance), sporadic action and a handful of trivial jokes, “Stand Up Guys” will not leave its mark but is perfectly appropriate for a relaxed watching, not requiring attention to details or complex analysis about its simple story.